Hello all and thanks for reading! I am having repeated issues with securing a 3”×3” 36” peice of cherry to my lathe. Well it’s about 33 inches now..lol. I’ve tried driving screws deep into the end grain. I am using a faceplate with 4 screws. My tailstock has a deep cup, but still it is walking out the peice. Why is this happening? Is the tailstock too loose? It has still walked out with the quill all the way into the peice…even then I let it press all the way into the wood, then retract the quill to slide the banjo closer, then tighten. Is this process flawed or am I just doing this the wrong way? Jerome, I hate to see anyone discouraged as I think you are. From what I can see, your tailstock was set up off center. Personally a cup is not the best center. However, when you are ready to start turning, start at a lower speed then increase if necessary. Are the screws holding the faceplate dry wall screws? That is a no no. The do not bend, they break. Use steel. As far as I can see, your problem is alignment and too much speed. The screws were not drywall screws. I learned that lesson. I think the centering might be the issue as to why it wiggled loose. I’ll triple check. Screwing the face plate in on center is the challenge seems like. I could also tighten up the tailstock more. It was discouraging so I worked on another portion of project some before I retreated for the night. Hi Jerome. Faceplates are not normally used for spindle turnings. You should be using a drive center instead of a faceplate. Faceplates are for platters, bowls and such where there is a large circumference. 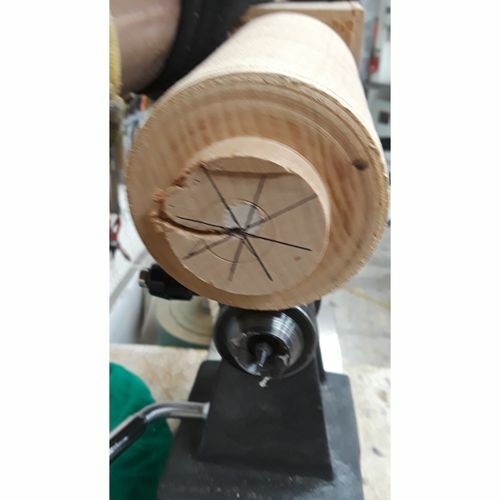 you can turn smaller circumference items like boxes held by a tenon in a chuck and this same method also works for bowls and other larger items too. 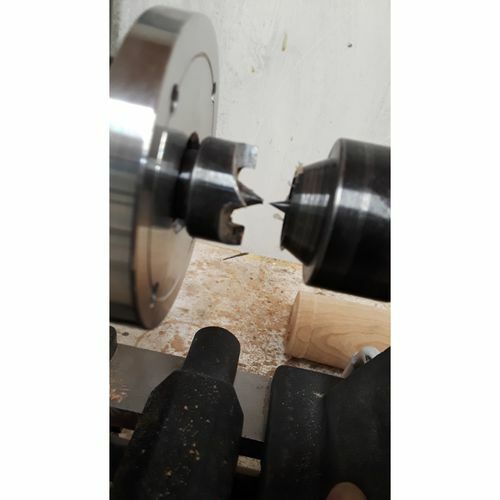 In that case the bottom can either have a tenon or mortise with the latter being held by expanding the chuck jaws instead of compressing them as you would with a tenon. I suggest you buy a book on turning basics. It will tell you everything you need to know if you are new to turning. That’s what I did 22 years ago and it got me off to a great start. 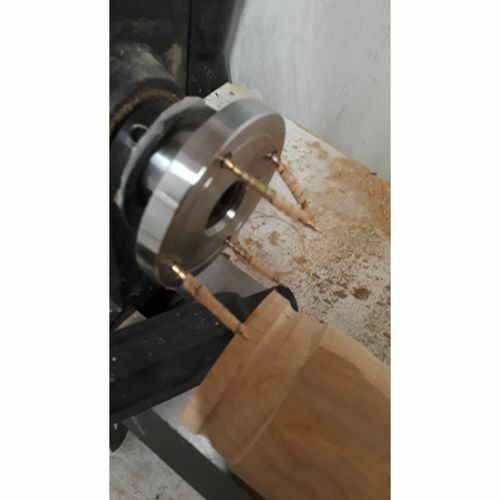 I don’t know anything about wood turning, so more a question: Most of the turnings I have seen use a chuck much like a metal turning lathe to hold the work firmly. Isn’t that the common approach? Screwing something in via end grain then rotating it at high speed would scare the heck out of me. BlueRidgeDog. You are talking about a scroll chuck, the most common come with 4 jaws. These are fairly expensive and not everyone has one. 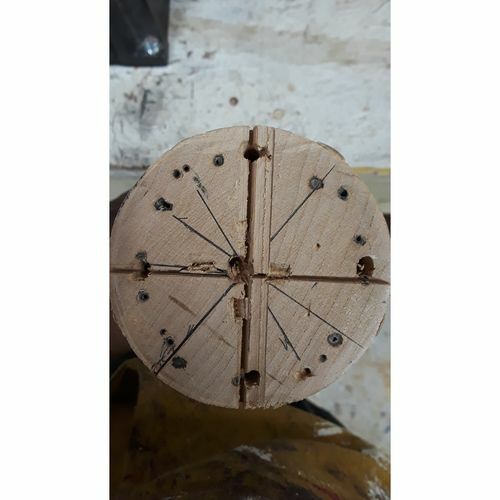 Many prefer a faceplate for bowls and other larger diameter turnings because it gives a better hold and the workpiece also remains balanced if you remove it temporarily from the lathe and then put it back on again underway. 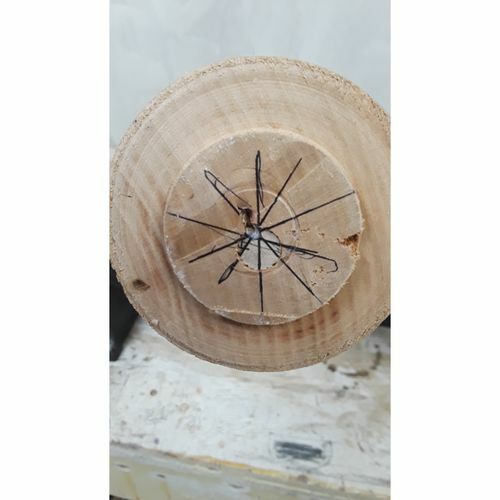 Long turnings like Jerome’s which are called spindle turnings should be done with a drive center because the amount of torque involved with a long piece like that will make it tear out screws with it’s thin surrounding wood and is unsafe. Your spur center won’t come out as long as you have adequate pressure with your tailstock (but don’t overdo it ). I don’t think the bubble wrap is a good idea. Good luck further! I gave it a go tonight with a renewed sense of determination, but I’m getting the same results. I think I have a cursed peice of wood! I cut a few relief paths for the drive spur to sink into. Two teeth went in voluntarily and the other two I gave some help with my mallet. I then pulled the tailstock close so that the cup depressed the wood. I noticed that when I advanced the quill forward, the tailstock slowly pushed backwards. I’m wondering if that is my issue because I cant think of anything else. I powered it up from a distance once again and noticed the vibrations get louder and pulled the plug before it flew out, and it was on it’s way! The speed is at the lowest setting 750 rpm. You can see from the pic the the tailstock began to slip away. My tailstock just won’t stay put. I plan on taking it up to woodcraft to compare my lathe to others and see if it is an equipment issue or whatever. Thanks! If your tailstock won’t stay put then that is certainly the problem. The locking mechanism must be defective either on the rails or on the top lock. Jerome, you may need to tighten the nut on the bottom of the tailstock locking mechanism. If you crank down on your cam lever and the tailstock can still move, that’s a problem. Just to point out another possible contributing factor… You show your tailstock is aligned at the spindle but, it looks like you have a bed extension installed there. 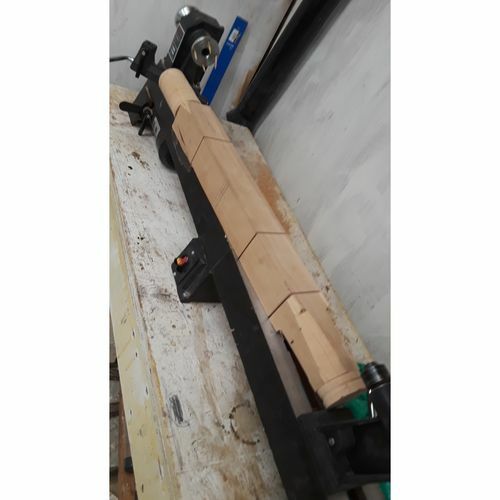 If your extension isn’t aligned with the main bed, or it has some twist or bow in it, then your tailstock could be misaligned at the longer distance. If you have just started turning, I learned from reading a few books and youtube. I have enjoyed a few of Raffan’s books as well. David Elsworth also has a good book, he has some DVDs as well. Ive met Carl before and watched a few of the Wyoming Woodturners videos. Hi Jerome. That mark in the tail end of the piece indicates that the center in the tailstock lost pressure and was not buried in the the wood. I do not like that live center with the ring on it like you have in the tail stock. I think you will have better luck with a plain live center without that ring. The ring stops the center point from burying into the wood ( as indicated by that ring on the end that spun out). Pick up a live center like this : https://www.ebay.com/itm/MT2-Live-Center-Morse-Taper-2MT-Triple-Bearing-Lathe-Medium-Duty-CNC/121618968551?epid=6011290875&hash=item1c510e2fe7:g:-QIAAOSwiBJaMEzC:sc:USPSPriority!85193!US!-1. You can put a lot pf pressure on it and it will hold in the center of the piece with out that ring stopping the forward pressure. The best way to start a piece is between centers. I always drill a 3/16” hole in the piece about 3/8’ deep for seating the drive center. That lets the spurs dig into the wood real good for good “traction”. You have to keep cranking the tail stock tighter too if you get a catch and turn out some wood under the drive center. And, choke up on the tailstock. Back it out as far as it will go before pushing the center into the work. that way you won’t run out of travel. If you do run out of travel, the tailstock center can come out of the wood for lack pf pressure. I have seen that happen more than once at school when the student cranks it in real hard but it is at the end of the travel and not pushing any harder against the piece. Out she comes! !